Re-Timer is University developed and scientifically proven to re-time your body clock. Since 1987, world-renowned sleep psychologists at Flinders University have studied the effects of light on the human body clock. The green-blue color has been chosen for both safety and efficacy. Green-blue light is most effective at influencing your sleep. Re-Timer light is UV-free and has been independently tested for eye safety to the international standard CEI IEC 62471. Re-Timer is worn while you are awake either in the morning or evening, depending on how you wish to incfluence your sleep. A recommended schedule of use is typically 7 days for 60 minutes each day. Traditional, older style “light visors” deliver light from above. 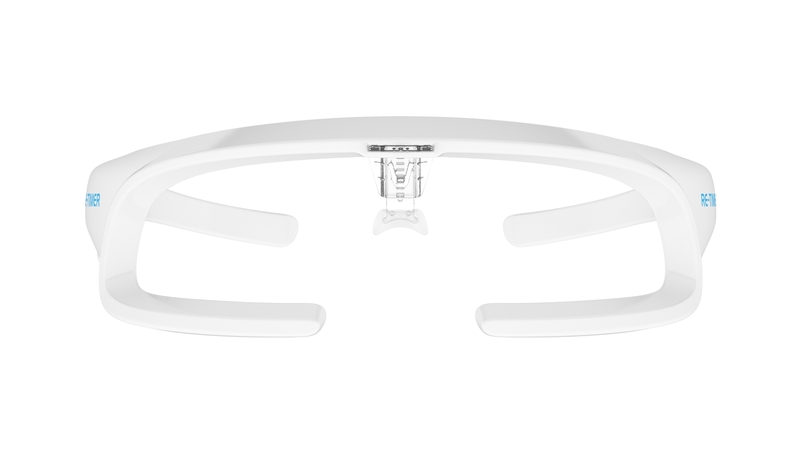 Much of the energy from a light visor will be blocked by your eyebrows. This reduces performance. Re-Timer is different – delivering light from below for maximum performance. Sleep clinics around the world use Re-Timer. “I see many people with body clock problems which can be readily managed with light therapy. Their ease of use and portability make them an excellent option…” Dr. Marcus McMahon. At just 2.64 ounces (75 grams), Re-Timer is the weight of sunglasses. Watch TV, eat breakfast or read the newspaper as you use Re-Timer. Re-Timer has an in-built battery which is recharged via a USB cable. Re-Timer uses light therapy, a natural solution.